The Cranwell Resort in Lenox, Massachusetts is an ideal family base for adventures in an area mostly visited by parents with kids away at summer camp, empty nesters and retirees. There are about two dozen historic Berkshire cottages remaining from the Gilded Age—many of those have been converted for lodging purposes. Cranwell is the most historic and upscale of these properties that also welcomes families. 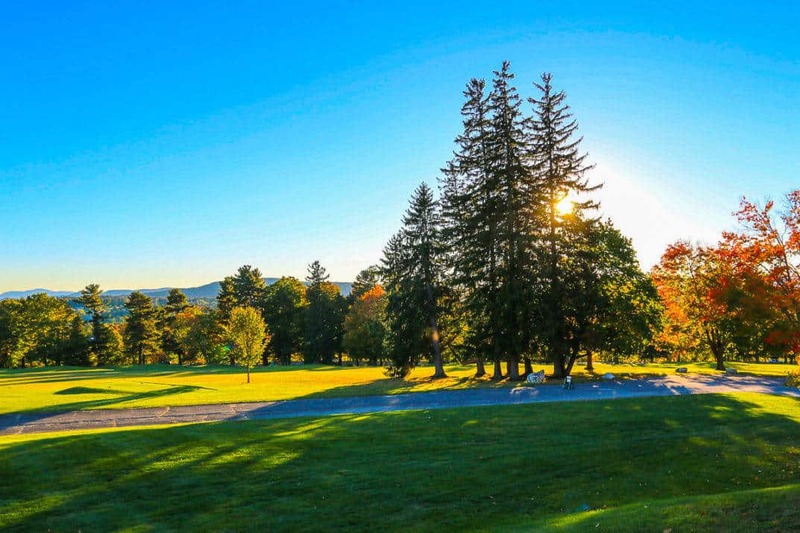 We just returned from our second stay, and we have now enjoyed the property at the peak of summer and fall and think there is no better luxury resort for families in the Berkshires. Can you see Cranwell Resort on the top left mountain? While other properties aim for a more intimate and exclusive experience, Cranwell is casual and welcoming and has added many new buildings with accommodations spread out on the property. The interior of the Cranwell Resort mansion retains a Guilded Age feel. Original touches like the fireplace in the board room at Cranwell. Wyndhurt is the formal dining room at Cranwell open for dinner. Although there are a few rooms in the original house best suited for couples, families will want the junior suites and suites, ideally in the Carriage House, as these rooms connect by glass hallway to the spa and pool. The perfect hallways to learn to walk the dog with a new Cranwell yo-yo. The Carriage House connects to the Spa, Pool, and Registration building by long glass hallway. A few townhouses are on property for even more space, but opt instead for rooms in the buildings connected to the indoor pool and spa by long glass hallways. The Carriage House is a three story building with elevator access, and our suite was very large. The junior suites are perfect for families if you don’t spring for the full suite. With two queen beds (excellent mattresses, by the way) and a pull-out queen sofa, we were very comfortable, and each room includes a Keurig coffee machine and refrigerator (Warning to coffee snobs: they serve the ubiquitous Green Mountain Coffee Breakfast Blend, but the free coffee at the front desk is much better). Large master bedrooms with the family suite at Cranwell. Family Suite living rooms offer foam mattress sleeper sofas. Spacious, new baths in the Carriage House rooms and suites. The bathroom was massive. The furnishings were attractive and new, but— the best yet— several delicious treats awaited us after a long drive. These in-room amenities can be ordered when placing your reservation. We received both a cheese tray and dessert try and a Cranwell-label bottle of red wine. It was important for me to photograph these for you before letting my family eat them. I should have photographed their painful facial expressions while I kept saying “Don’t touch!!! Don’t touch!! Not yet!! One more second! !” So, please, enjoy these pictures brought to you with lots of volume and toddler anguish. The hardest photos to take in the article. At check-in, children are given a resort scavenger hunt to complete. It gave us an excuse to tour most of the resort like the spa, main house, pro shop, and both pools. The prize at at completion was a yo-yo. My children would have happily played with yo-yos in the connecting glass hallways for hours. Could you do walking the dog with your yo-yo back in the day? I still can’t. My kids completing the Cranwell scavenger hunt the first time in 2014. Cranwell scavenger hunt completed in 2014. Rushing to claim a yo-yo for a completed scavenger hunt. Throughout the grounds you’ll find swings, lawn and board games to occupy the time not exploring the Berkshires. It is a very relaxing with small children in that at no time during our stay was I nervous or uncomfortable with my children being kids. It’s casual with the exception of the Mansion dining room, Wyndhurst, in the evenings. Lawn games and swings for families to enjoy on the magnificent grounds. Whiffle ball is better in the Berkshires. For less improvisational fun, there are indoor and outdoor pools plus tennis; the kids get to golf for free, and the wintertime brings ice skating and cross country skiing. The spa and salon offer a complete list of treatments and salon services using upscale lines like Barbor. The spa’s boutique had a selection of gifts, toys, books, clothing, and skincare products for children as well as salon services for children. The indoor pool at cranwell is connected to some rooms on the property by glass hallway. Breakfast is served buffet style in the Mansion, and it’s comprehensive. Room service at Cranwell is very limited with a small menu. It works to have pizza or burgers in your suite for a night in, but the choices are few. There is no room service menu for kids. Cranwell Resort’s breakfast buffet in the Mansion. Sloane’s Tavern is the casual restaurant for lunch and dinner, but not as strong as the options in Lenox worth trying. Given its proximity to the town center, it is easy and fun to take the kids for pizza, ice cream, or a causal dinner. Haven is outstanding for breakfast and lunch in the Lenox town center. Haven offers cocktails and excellent food in Lenox. Haven is our favorite in Lenox, an upscale bakery and café that offers cocktails, too, and it offers exceptional gluten-free choices. Square cakes in many varieties are served in wax paper, and the croissants are dreamy. Cranwell Resort’s magnificent front lawn. Our stay at Cranwell was far too brief to take advantage of all things to do in the resort, much less Lenox. I would be eager to return, even as a non-skier in the dead of winter because of the great connecting glass hallways from the rooms to adult fitness classes, spa treatments and a spa cafe. This mama would be very happy, and the indoor pool would keep the kids engaged. Considering so many other lodging options are bed and breakfasts, Cranwell is the clear choice for me as a family traveling with young children to the Berkshires. If you head further North in the Berkshires, we recommend you check out the Porches Inn at MASS MoCA, our favorite family choice in North Adams. We were guests of Cranwell Resort for this stay, but our opinions expressed in this article are fully our own. 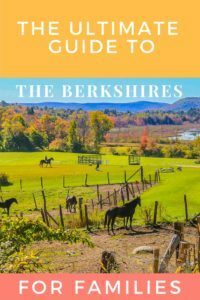 So much to do in the beautiful Berkshires. Thanks for another great option. The Berkshires are, indeed, incredible!